In the June 2011 Archives of Surgery, a systematic review was published demonstrating that bariatric surgery leads to marked and long-lasting weight reduction, and may be capable of improving or even curing type 2 diabetes. The analysis reviewed findings from nine studies that followed obese patients with diabetes who underwent either gastric bypass or gastric banding for 1 year. Rick Meijer, MD, and colleagues from Amsterdam found that Roux-en-Y gastric bypass led to a reversal rate of type 2 diabetes of 83%. 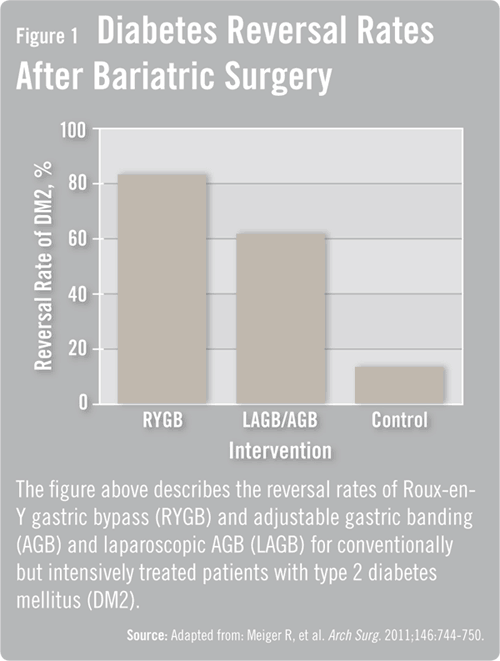 Adjustable gastric banding led to a reversal rate of 62%, and this effect was achieved later after surgery (Figure 1). According to the study by Dr. Meijer and colleagues, the underlying mechanisms leading to improved glycemic control after bariatric surgery only have been partly elucidated. There are several mechanisms that should be considered responsible for the resolution of diabetes after bariatric surgery (Figure 2). “Hopefully, more data will emerge on the mechanisms of the resolution of diabetes related to which bariatric procedures are performed in obese patients with diabetes,” adds Dr. Gould. In addition to the beneficial effects on type 2 diabetes, improvements in other important risk factors partly explain the reduced mortality rates that have been observed after bariatric surgery. For example, hypertension improves in about 80% of patients after they receive their operation (see also, Helpful Guidelines for Heart Health in Diabetes. Other studies have shown that hypercholesterolemia and hypertriglyceridemia improve after surgery. Furthermore, cardiac function appears to improve, and obstructive sleep apnea appears to lessen postoperatively. Meijer R, van Wagensveld B, Siegert C, et al. Bariatric surgery as a novel treatment for type 2 diabetes mellitus. Arch Surg. 2011;146:744-750. Gould J. What’s in a name? 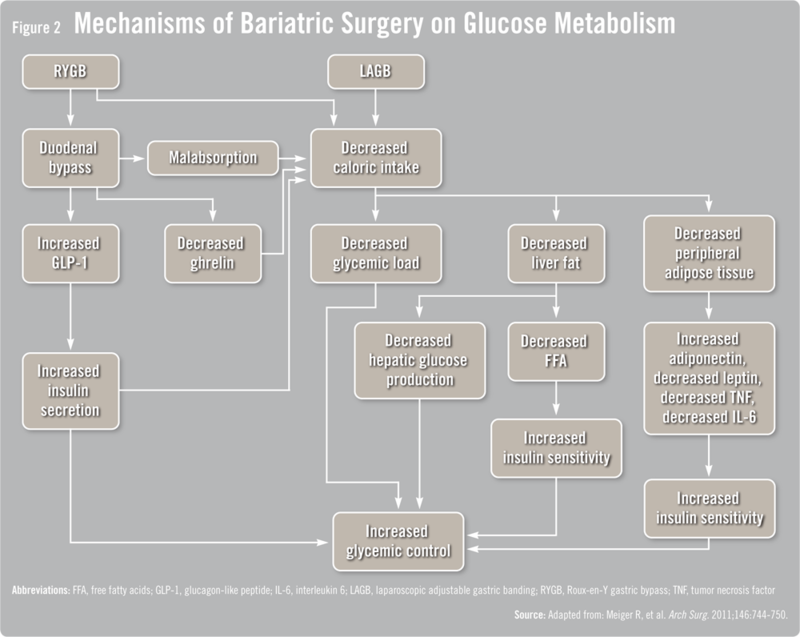 Comment on “Bariatric surgery as a novel treatment for type 2 diabetes mellitus.” Arch Surg. 2011;146:750-751. Zhang H, Wang Y, Zhang J, et al. Bariatric surgery reduces visceral adipose inflammation and improves endothelial function in type 2 diabetic mice. Arteriosclerosis, Thrombosis, Vasc Biol. 2011. Jun 16 [Epub ahead of print]. Available at http://atvb.ahajournals.org/cgi/content/short/ATVBAHA.111.225870v1?=1. Cui Y, Elahi D, Andersen D. Advances in the etiology and management of hyperinsulinemic hypoglycemia after Roux-en-Y gastric bypass. J Gastroint Surg. 2011. Jun 14 [Epub ahead of print]. Available at www.springerlink.com/content/t370770117r26556. Camastra S, Gastaldelli A, Mari A, et al. Early and longer term effects of gastric bypass surgery on tissue-specific insulin sensitivity and beta cell function in morbidly obese patients with and without type 2 diabetes. Diabetologia. 2011. May 26 [Epub ahead of print]. Available at www.springerlink.com/content/j64j449g42507207. Eckel R, Kahn S, Ferrannini E, et al. Obesity and type 2 diabetes: what can be unified and what needs to be individualized? J Clin Endocrinol Metabolism. 2011;96:1654-1663. NextWin an iPad from the Patient Education Center! Jon C. Gould, MD, has indicated to Physician’s Weekly that he has or has had no financial interests to report. general public think bariatric surgery is mainly to loose weight, it is critical to educate the public the added and very important metabolic benefits are added bonus.